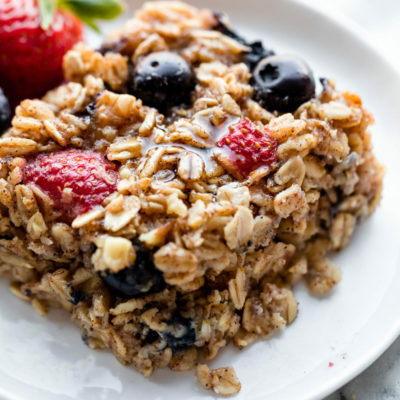 This baked oatmeal combines simple and healthy ingredients and can be adapted for any allergies or flavor preferences. Stir the ingredients together in 1 large bowl, pour it into a greased baking pan, and bake. Oats: I recommend whole old-fashioned style oats for a hearty and satisfying texture. Maple Syrup: I recommend pure maple syrup for the best flavor, but other unrefined sugars such as coconut sugar or honey work too. 1/2 cup sweetens the entire dish. I used Stevia and it was great. Berries. Add some fruit for flavor, texture, and all-around deliciousness. Replace with chopped banana, apple, peaches, pears, raisins, dried berries, chocolate chips, or even a spoonful of your favorite nut butter.